We have had hedgehogs in the garden for many years. They can travel as much as a mile at night, so we can never be sure that they are same ones, but they are at least regular visitors. There are openings in hedges and fences on both sides, so they can come and go easily, and are often seen by early risers of our household. To accommodate them, we have plenty of undergrowth making nooks and crannies for them to hide under. There are slugs and worms and plenty of water sources – although we have to be careful not to leave open water butts that they can fall in and not get out of. We always hope that they will choose to live here over winter, so we provide a nice hedgehog house that I bought from the recycling centre for £2, this year re-vamped with roofing felt, and plenty of autumn leaves. 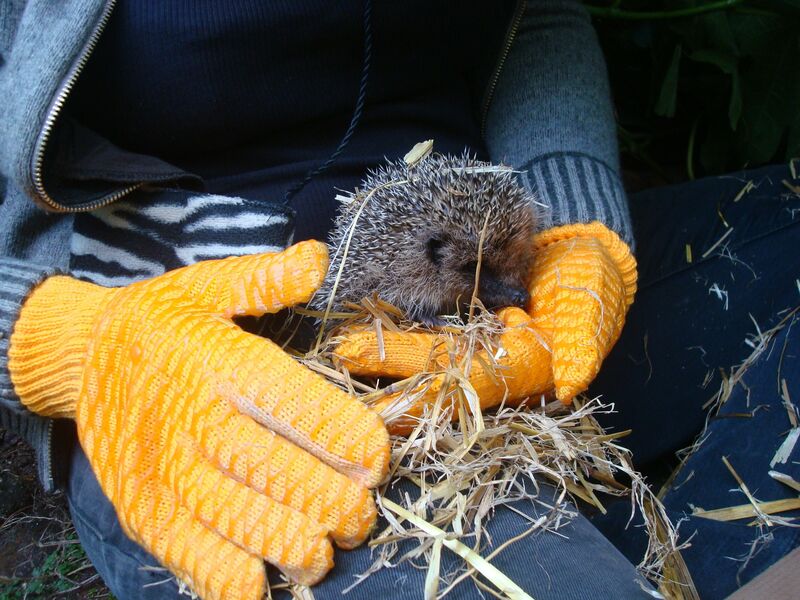 It is worth always wearing gloves when handling hedgehogs or their bedding – not because of spines, but because the human scent can scare them off. Suburban permaculture plot and forest garden featured in Permaculture Magazine.